In order to keep our freshwater fish populations healthy and thriving, the Florida Fish and Wildlife Conservation Commission are authorized to implement rules and regulations as the need arises. You will need to be continually aware of them to ensure that our freshwater fish species survive into the future; and there are Angler Recognition Programs to reward you for your efforts. Any breach of these stipulations will result in a hefty fine, or worse. Before you head off on a fishing trip to any of Florida’s freshwater dams, rivers and lakes; make sure that you are knowledgeable about the latest fishing regulations for the water area you are going to be fishing in. In fact, it is advisable that you carry a printed version with you, along with the required fishing licenses. While some regulations may change yearly, there are set rules that may not be broken. All Sturgeons are protected by Federal Laws and in the State of Florida. If you catch one inadvertently, immediately release it back into the water alive and unharmed. These are the Rules and Regulations for Freshwater Fishing in Florida that will never change. Please visit the website of the Florida Fishing and Wildlife Conservation Commission for the latest information. We do not only offer fishing charters in Miami, we have other exhilarating activities as well. Our Miami Go Fast boats are up for hire and they are perfect for speed enthusiasts looking for the ultimate thrill. Extreme velocities ensure jaw wobbling, cheek smearing and tear duct draining adventure. Our luxurious speedboats in Miami offer all this and more. There are many Catfish species in the order Siluriformes occupying freshwater in every continent except Antarctica. There are massive ones and smaller ones. There are long ones, short ones, fat ones and thin ones. Most of them have prominent barbels that resemble a cat’s whiskers and are responsible for their name; but there are a few that do not have whiskers. Found in freshwater lakes, rivers, streams and ponds, Catfish are a prized catch for many anglers. Not only are they tasty, they can grow into extraordinarily enormous fish. The bodies of fresh water in Florida teem with Catfish varieties; the most popular of which are the channel catfish, blue catfish and flathead catfish. These monsters are among the biggest freshwater fish on earth and they are exhilarating to catch. Catfish live inland or in coastal freshwaters of every country. They are most diverse in tropical waters around the Americas, Africa and Asia. Most of them prefer shallow, running water but some are known to live underground and some even in underwater caves. Although these fish prefer freshwater environments, there are a small number of species that live in saltwater. They have many nicknames in Florida, but these names may refer to another type of Catfish elsewhere. Catfish have heavy, bony heads and reduced gas bladders that cause them to sink instead of float. Their body shapes vary according to the species but most of them have cylindrical bodies with a flattened head and mouth. This allows them to dig along the bottom for food. They have very large mouths that contain no teeth. They rely on gulping their prey into their mouths instead of cutting or biting into them. Some rarer species have suction mouths that allow them to fasten themselves onto objects. They have a reduced maxilla that supports their barbels, making them unable to protrude their mouths. Catfish may have up to four pairs of barbels. One can be found by their nasal cavity, another by their mouth and two appear on the chin. These unique characteristics are there for a reason. Along with their chemoreceptors (found along their bodies), their barbels help them to “taste” and “smell” anything they touch; including chemicals in the water. This is how they detect and locate their food. They do not rely on their eyesight for hunting and their eyes are therefore small. Catfish also appear to have advanced hearing. Scales are lacking in Catfish. Their bodies are naked although some species wear armor plates that vary among them. This is because these fish breathe through their skin and it is why there is a mucus layer over them. Catfish have a powerful, hollow and bony spine on their dorsal and pectoral fins. These can be locked into place as a defensive mechanism; and they can cause severe injury. Some species produce a protein that can be injected via their spine, acting as venom. In certain species, hospitalization may be required if you are stung. In others, fatalities have been recorded. In most catfish though, these stings are not venomous. Virtually any type of rod and reel setup will work for catching Catfish. If you are fishing from the banks then a longer rod will allow you to cast further and have better manoeuvrability around cover. If fishing from a boat, you can use a shorter rod. The lighter your tackle and rod, the more you will feel the exhilaration of these strong fish as they fight you. Keep your tackle simple. Use small hooks that are sharp. These fish have thick mouths that blunt hooks will not penetrate. We recommend using 17lbs braided line and medium heavy spinning outfits for the larger Catfish. Attach a light weight about ten inches from your hook to keep your bait near the bottom. These hungry fish have no problem gulping baits of all varieties. Fresh shrimps, crawdads, chicken livers, bread dough and cut baits such as minnows, bluegills, crappies, shad, herring or anything will be devoured by them. Cheese, hotdogs, bologna, stink baits, night crawlers, worms, grasshoppers, you name it and they will eat it. Live bait works well but cut bait works better because their body fluids can be smelt from vast distances. Catfish are hungry at dusk and dawn. The best time to go fishing for them is in the morning, as soon as you can see what you are doing. By fishing early, you will increase your chances of catching them tenfold. Use chum to attract them. You can use anything with a strong odor, as well as sour grain. Throw some balls of chum where you plan to fish and you are sure to catch many. Keep your line tight with your weight just at the bottom. Be ready to set the hook the minute a fish bites because they will steal your bait and nibble it right off if you do not do this. We recommend holding your rod and keeping a finger on the line to feel when a fish is biting. You can use alarms and other alerter products but often you are unable to react fast enough. If fishing from the bank, cast as far as you can and let it settle. Reel in a few metres every five minutes or so. This will cover a larger area for locating the fish and will cause the mud to rise and settle again – attracting any Catfish in the area. Look for water that moves at different speeds. Where these two speeds meet is a fantastic place to find these fish. They will not expend unnecessary energy fighting the current. Look for breaks in the current such as rocks, trees or other bottom structure. The current moving over it erodes deep pools. Catfish will often lurk there and dart out to ambush prey swimming past. Call today to book your Catfish Fishing Charter in Florida and discover the monsters of freshwater. Florida has the Atlantic Ocean on its eastern coast, southern coast and western coast. The Florida Keys are surrounding by these waters; which are warm and perfectly ideal for some truly big game fish. Most of the main currents flow into the Atlantic Ocean from the Caribbean Sea where many of these fish go to spawn. They migrate along the Gulf Stream current and pass close to the coast of Florida. On the eastern coast of Florida, the Gulf Stream current is used as a migratory route for millions of fish every year. It passes within a few miles of the shore and huge fish can frequently be caught extremely close to land. Their food sources travel in this current and they follow them hungrily, happily devouring our bait in the process. This is one of the best locations in the world to catch truly awe-inspiring fish. The western coast of Florida faces the Gulf of Mexico. This is a nursery for millions of fish species that spend their primary years developing here before being big enough for migration. They float on the current from the Caribbean Sea before being pushed into the bay. These fish attract extremely large fish which prey on them. This enormous wilderness consists mostly of water. Not all of it is saltwater but the tides extend far inland from the Gulf of Mexico, and many saltwater fish swim inshore with them. Tarpon, great barracuda, snook and other saltwater fish survive happily in these waters. There are also a number of convenient waterways that will quickly get you into the Gulf of Mexico for delightful fishing action. the best opportunity possible to catch the biggest fish of your career. Call now to book your Saltwater Fishing Charter in Florida and delight in the opportunities. We can ensure that you have transportation. We can organize a car for you to drive around in. We can arrange for a taxi (even a limousine) to deliver you to and from our docks. Wherever you come from, wherever you are going; we will make sure that you are not stranded when enjoying a fishing vacation in Florida. Being out on the ocean (or even inshore) will make you hungry and thirsty. You are welcome to bring your own food and refreshments onboard with you. We have several catering options available and will be happy to provide you with them. There is a cooler onboard all of our fishing boats that will keep drinks cold and food fresh. Usually our clients opt for sandwiches, drinks and beer; but we can cater to your specific tastes as well. Most of the fish that we catch are found very close to shore. The Gulf Stream current is a few short miles away and takes us minutes to get there. This allows us to take you on a short sight-seeing detour that will allow you to explore the vast waterways. You can enjoy the beauty of the city from the safety of our luxury fishing boats. We can help you find the perfect vacation rental, lodge, resort, hotel, holiday cottage or beach house for your stay in Florida. You give us your budget for accommodation and we will find the best deal for you, regardless of where you wish to stay in Florida. There are so many varieties of big game sports fish swimming off the coast that is it sometimes hard to decide which ones you want to catch most. Instead of agonizing over this, why not catch them all? We can arrange for you to catch different fish over the course of several days, and you can experience it from our various fishing boats. Your fishing vacation must be spent the way you want to; so we can focus on catching a specific fish on one day and another next – and so on. We can exhilarate in so many types of fishing if we have the time to do it, and many more options become available to you. Some of the best fishing in the world occurs in Florida; but the best fishing grounds are near Islamorada, Key West, Destin, Fort Lauderdale, Miami, Stuart and Palm Beach. These are the most popular destinations for fishing and these are the cities where most of our clients prefer us to arrange their fishing trips. We recommend visiting these cities if you are coming to catch fish, but we will be happy to make arrangements for you if you are anywhere else in Florida, the Bahamas, Panama, the Dominican Republic and even in Costa Rica. Contact us today and let us arrange your Fishing Trip in Florida for the ultimate adventure. Hordes of resorts and lodges are available for accommodation in Florida and we offer fishing charters from almost all of them. Our services extend into the Caribbean and we can take you on a deep sea fishing trip from Costa Rica, the Dominican Republic, Panama and any of the islands around the Bahamas. Many of you will be coming to these locations specifically to catch some of the most spectacular big game fish found anywhere in the world. The Atlantic Ocean with the Gulf Stream current, the Gulf of Mexico and the Caribbean Sea all offer a myriad of exhilarating sports fish to challenge you. The entire mid-western Atlantic is a migratory route and spawning ground for fish of all shapes and sizes. We regularly take clients to catch the fish of their careers; and these include such monsters as swordfish, sailfish, mahi-mahi, grouper, wahoo, barracuda, blue marlin, snapper, sharks, tuna and a variety of other thrilling and exciting fish. The tropical regions of the western Atlantic Ocean are thriving with sports fish. They spawn here, they migrate here and they hunt near the surface of the sea or in vast underwater canyons. Fish such as swordfish, sailfish, mahi-mahi, tuna, marlin, grouper, snapper, wahoo, barracuda, sharks and hordes of others inhabit these waters and you can catch any or all of them. We offer fishing charters from all the locations listed above. You can climb aboard our luxury fishing boats at your nearest marina. Call today to book your Big Game Fishing Charter and experience the phenomenal variety. There are so many fishing captains and guides in Florida. They all scramble around offering their services. Fishing is incredibly popular in Florida and there is a big demand for fishing charters. Unfortunately, finding the best of them (or even marginally acceptable ones) is not easy unless you know some people that can advise you. Randomly selecting a guide to take you onto the ocean may prove to be an incredibly unpleasant experience and could even be potentially dangerous for you. We strongly recommend thorough research before choosing a guide and fishing boat. Alternatively, we have selected the best fishing guides in Florida and have done this work for you already. How do we choose our fishing guides? Fishing guides need to have extensive local knowledge such as where to find different fish, how to catch them, how to use the techniques certain fish require, how to use the equipment needed, which fish are edible and they need to know how to navigate their way through the Atlantic Ocean. Added local information is also essential; such as the best restaurants, accommodation, bars, tourist attractions and reputable companies to refer clients for other activities. They also need to know where the nearest medical facilities are in the case of someone being injured. Fishing experience is of paramount importance in a fishing guide. You do not gain knowledge unless you have experience. Finding fish, catching them and knowing everything about their habits means practice. Ensuring that their clients have the best chance possible of catching the fish they are targeting requires years of acquired experience. Only practice will teach you how to deal with certain situations such as seasickness, injury or other unforeseen circumstances. Customer satisfaction is the most important part of being a fishing guide and we use such information to choose the best guides for us. We interview customers and get valuable feedback from them. An unsatisfied client is quick to tell you why they had a bad or mediocre experience, and they are notoriously particular. Their opinions give us the insight we need to know whether a potential fishing guide has what it takes to be part of our team. We expect our fishing guides to provide our clients with the necessary equipment. They need to know exactly how to use every item and it must be of exceptional quality. Rods, reels, spinning reels, tackle, monofilament line, fluorocarbon line, circle hooks, treble hooks, dredges, kites, lures, buoys and even bait needs to be provided. Their fishing boats need to be outfitted with the latest tournament grade equipment so that our clients have the best chance of success. Many of the fish caught in Florida will easily overpower cheap rods and reels, which is unacceptable to us. It is critically important that potential fishing guides have the best boats. They need to be exceptionally clean, be serviced regularly and be well maintained. Engines need to be in perfect working order, as do other essential parts. Boats need to be fast and supremely comfortable. Most importantly, they need to be safe. This means that they must comply fully with any and all United States Coast Guard Regulations. Our fishing guides need to be friendly and easy conversationalists. Their knowledge needs to be shared with all anglers onboard in a way that makes them feel like they are doing really well. We do not want our clients to feel stupid when they are learning, or be shouted and screamed at when something needs to be shown again. Our guides need to uplift our clients and take their needs into consideration as a priority. A belligerent fishing guide will never be a member of our team. Our standards are extremely high and potential fishing guides are scrutinized in every conceivable way. You are guaranteed a knowledgeable guide that will help you to catch a truly monster fish. Their expertise ensures you have the best possible chance of your trophy or lifetime career fish and an extraordinary adventure is assured. We have chosen the best fishing guides in Florida so that you do not have to. Contact us to book your Fishing Charters in Florida and meet our phenomenal fishing guides. Thinking about a career in fishing? 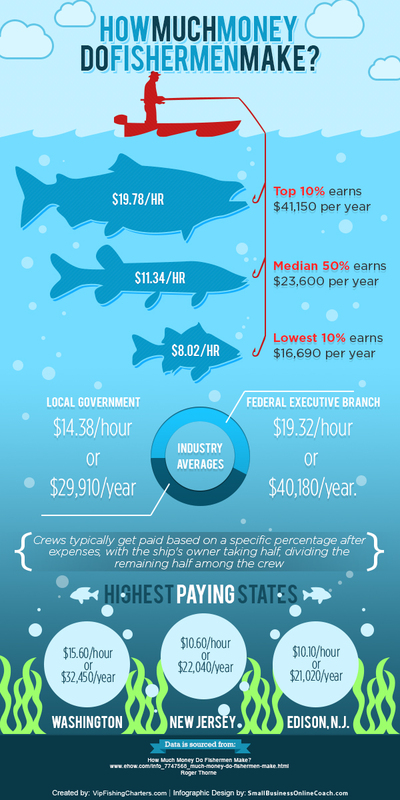 Check out the first in our series of infographics for information on typical wages for a commercial fishermen in the United States. While it might not be the most lucrative career, it's certainly a lifestyle that many outdoorsmen dream of pursuing.